2 A Camera wait for you! With Android, Nokia turn back & leading role in smartphone during the last fair of MWC 2017. Most Nokia lovers expect more to the Finnish company. However, the Nokia 3, Nokia 5 and Nokia 6 focused on the mid and entry ranges, leaving the high-end range. However, this could change soon depending on the latest buzzes in everywhere. Little by little, the rumors and thoughts spread on so-called high range of Nokia smartphone. 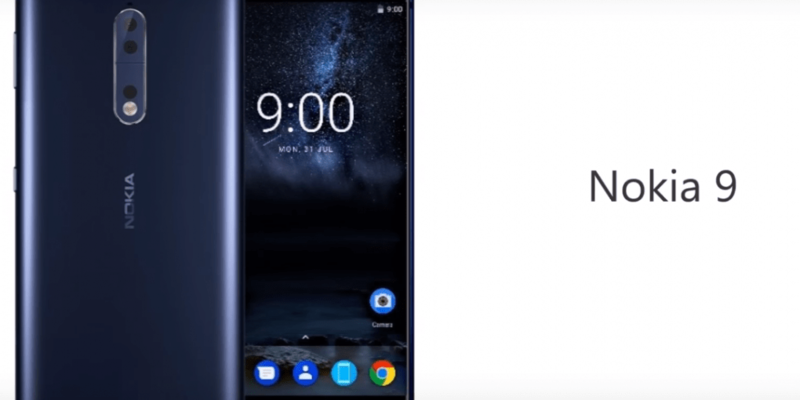 A new device come into the pool of Nokia’s future, this will be the Nokia 9. Nokia’s return on the market dedicated on strategies that stand out for balanced features and good value for money. The second phase would focus on the high end. Finally, Nokia 9 would be the most advanced model among the three. We already observe the perfect combination of the success. They promised new additions to its series by re-release of its classic Nokia 3310. Finnish company try to fill up the gap with the best specifications & design by offering of Nokia 3, 5 and 6 to its user. It would be not lie if I say that the Nokia 9 is one of the most awaited smartphones of the year for Nokia fans with the most landscape of androids. The Finnish firm is already preparing to disclose its first high-end mobile powered by Android. However, Nokia has not publicly confirmed the device but the truth is that it has a bit advanced remarks as Nokia wants to cope mobile market gradually. In future, Nokia 9 will be high position or at least a better place what it seems according to information we come across publications that present images and designs of device. Still that are rumor, but expected to be true. Surely, that information not come from origin manufacturers. The ideas that some designers launch as their concept. Now more information have been leach out, specifically those corresponding to the price how it could turmoil the cell phone market. For this case, we explore today; we love to see in real, not only in concepts. At present, HMD, the company responsible for the Nokia brand, has decided to leave the best smartphones by the middle or end of the year, mainly because in this period the leading role by new flagship of Samsung, LG and HTC. Their plans compete heavily with the new Galaxy S8, LG G6 and HTC U Ultra. It could be made effective in early August by launch its high-end Nokia 9 smartphone. A Camera wait for you! There are still uncertain as forthcoming Nokia that could include 22-megapixel camera (while the front camera would stay at 12 megapixels) with lenses origin by Carl Zeiss. If that true, the Nokia 9 has all the credits to be the first Nokia with Android to incorporate one of these great lenses, which, attached with a good sensor. A optimize software to match with the Nokia 9, could shoot at the most High of mobile photography. Other features such as the iris scanner or the IP68 water resistance, all of which belong to a first-class smartphone. It is necessary to follow the Google Nexus, to enjoy a full experience with Android. Nokia, working with Google to develop their latest cell phone, and announcing that their upcoming handsets would have a completely pure software with latest android. In addition new versions of Android, getting regular updates with security patches for at least two years. Certainly, this option is dream of every user of the Google Android operating system. Now one can get each high range device signed by Nokia. NokiaPowerUser, specialized blog that has made predictions of Nokia 9 and that today brings us what would be the top range of technical specifications. With its most outstanding features, Nokia 9 would feature a 5.5-inch OLED screen and QHD resolution. In the section of the power would bet by the chip Snapdragon 835 of Qualcomm that accompanied by 6 GB of RAM memory. Without a doubt, speculation will be true if all that are in this new device. In addition, some sources disclose that, Nokia 9 would have a body made of aluminum (IP68 certified water and dust resistance), and will not miss such details as the fingerprint reader, the USB Type C or the 3.5mm jack for headphones. Nokia OZO Audio technology, optimized for headphones and spatial audio playback systems. Before we conclude, we have to look for the price as important as for user. Nokia 9 will be the new flagship killer of 2017. As its prediction features that stand at the height of the most expensive handy in the present mobile market. We have learned through the website Nokipoweruser, everything indicates that the definitive price of Nokia 9 would be around 749 euros. While in the United States could be worth of $699. Finally, we only need to know what will be the Nokia 9 release date. As we stated at the beginning of this article, the company has not yet decided on the existence of this terminal. However, some sources already indicated at the time that the company would hold an event between July and August this year. According to information from portals Nokia Power User and Xiaomi Today, the smartphone will be announced at the end of July and would go on sale in September. What do you expect from the new Nokia New release?